I’ve been enjoying the Thinking Out Loud series on Meg’s blog and decided to go for it myself this week! 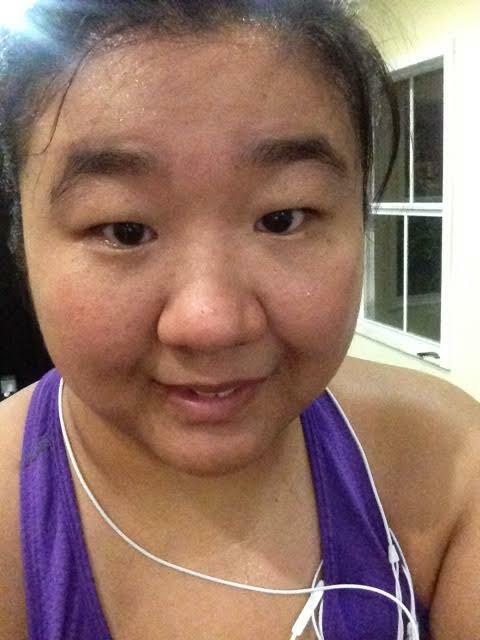 Thanks to Amanda @ Running with Spoons for hosting the link-up! Yes, you read that right. 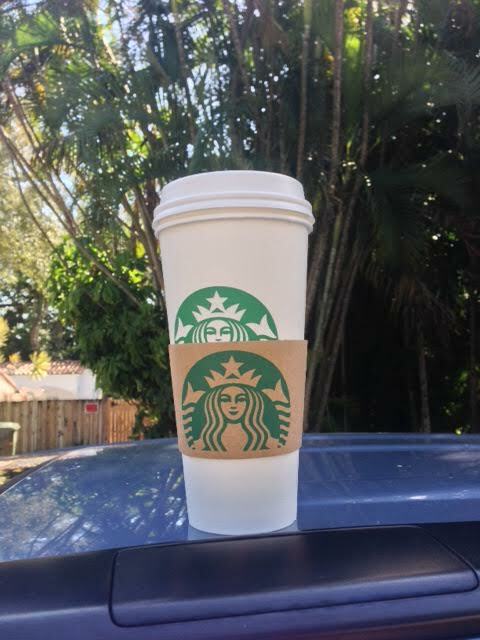 Every single afternoon during the work week I stop at Starbucks and pickup a venti Awake tea (just your standard black tea). My office provides us unlimited coffee in the form of k-cups but I love my tea. If I kicked this habit I would definitely save a lot of money, but it’s so worth it to me because the tea helps me de-stress and enter my afternoon in a good mood. In fact, a study in 2009 found that drinking tea (or coffee) can reduce your stress levels by 68%! The $2/day (or $500 a year) is totally worth it to me to keep my happiness levels up! 2. Cecil as a kitten is the most adorable thing ever! 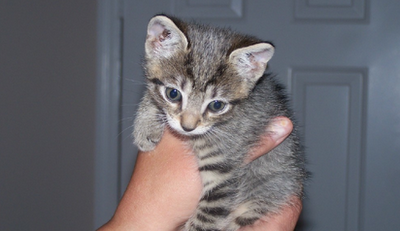 If a large tea isn’t enough to put me in a good mood, I just pull up a picture of Cecil as a kitten. When I adopted him he weighed all of two pounds! He was the cutest, feistiest little thing I had ever seen… not much has changed. And nothing can put a smile on my face like him! 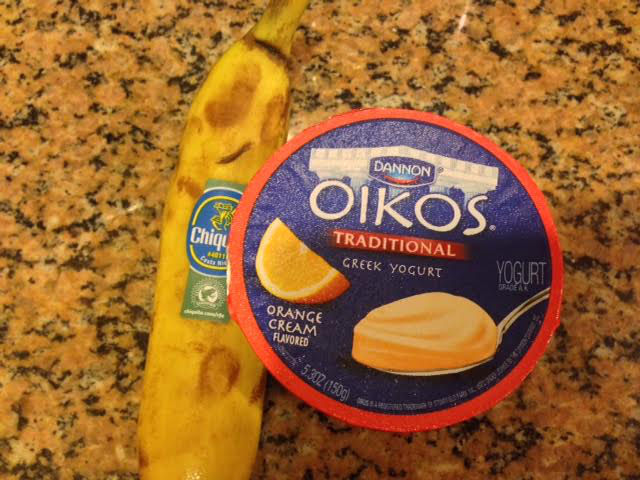 This orange cream Greek yogurt has a TON of sugar in it but is sooo good. It’s actually too sweet for me to eat plain, but with a chopped up banana mixed in it is the best dessert ever! Seriously. The next time you’re craving something sweet try this! I officially broke my workout streak yesterday and took a complete rest day. Since I did XT on both Monday and Tuesday this means I haven’t run at all yet this week! Whaaat. I’ll definitely be running tonight! To be honest my body has been feeling achy and my sinuses have been driving me nuts. Taking the last few days off has felt really good, but I am so ready to hit the pavement today! 5. My vacation days for this year got approved yesterday! I can’t wait for our vacations this year! We had hoped to sneak in Colorado for some good hiking this summer, but instead we’ve decided to extend our London trip by a couple days. This is sort of a bummer because I was really looking forward to some good hiking, but we just thought after paying so much for a plane ticket to London that we should stay for at least a full week and really explore. Our first trip of the year will be to Vegas though and that takes place in May. It’s just a short 4-day trip but I can’t wait. We haven’t gone to Vegas in a couple years and it’s always a blast! 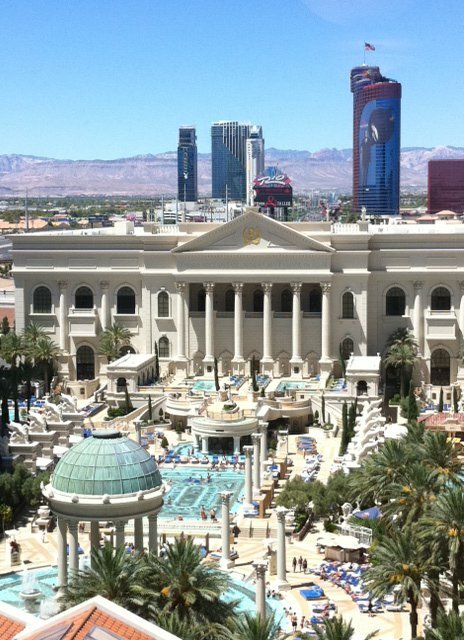 View from our room at Caesar’s Palace last trip. And there you have it– my first Thinking Out Loud Thursday! What trips are you looking forward to this year? Do you have anything that you spend money on as a guilty pleasure or just because it makes you feel better (even if it is kind of a waste)? Previous Post Celebrating a Year of Run-Blogging + The Best Runner Ever! I couldn’t agree with you more about the importance of a little bit of Starbucks indulgence. I used to get a dry cappuccino from them every.single.day, which added up to a lot of coin, but it was something that I looked forward to so much that I could justify the price tag. And Vegas?! Eee! I seriously love that city! I try and go every year, and I’m seriously hoping to make it out there this summer. So.much.fun. Vegas is a blast! Before I went, I never would have thought of myself as a Vegas-y type person but there is a little bit for everyone. I love Blackjack and I love seeing the Cirque shows! When I was in college, my dad made me figure out how much I spent on Starbucks yearly, so that I could see what percentage of my allowance it took up. I quickly switched to brewing at home. I LOVE SBUX and I get it on occasion, but I just can’t justify the price anymore! Yikes, your comment just made me think about how much it totals up to over years. $500 I can live with but that quickly totals up into the thousands! I may need to rethink my tea drinking situation as much as I love it! I can’t even remember my last Vegas trip but I love that place. We actually haven’t planned any trips for this summer – better get on that! Mmmmm ice cream + peanut butter is never a bad idea! I get Cecil the normal Tidy Cat litter but spend a small fortune on his food too. He has a super sensitive stomach and can only handle the Wellness Core wet food and he eats 3 small cans a day… so expensive but at least he doesn’t throw up after every meal like he did before we found a food he could handle! Isn’t planning vacations (short or long), so exciting? We just planned our vacation back to the States for September & I have already started counting down the days. Since I’m still a new reader, are you talking about London in Europe or London in Canada? Whichever, it sounds like y’all are in for a wonderful time! Where in the states are you visiting?? $500/year WHAT??? Buster was super cute when he was a puppy, I like looking back at pictures. I love vegas, we havent been back in a few years either. Our trip destination have changed now that we are running. Most of our trips moving forward will probably include races lol. You are just like me, taking a few days off from running is really nice, but I get that itch bad to get back out there and run.